You can learn a lot from first impressions — which is good because, as she sits down for an interview on her first day at Dalhousie, Teri Balser is overloaded with them. And she wouldn’t have it any other way. “There’s a lot going on here at Dal — and a lot of great energy,” says Dr. Balser, who arrived at Dalhousie as the university’s new provost and vice-president academic on November 1. It’s really amazing to see how friendly and positive everyone is. It’s very welcoming, very forward-looking. Dal’s in its 200th year, but there’s more energy than you might expect in a 200-year-old institution. 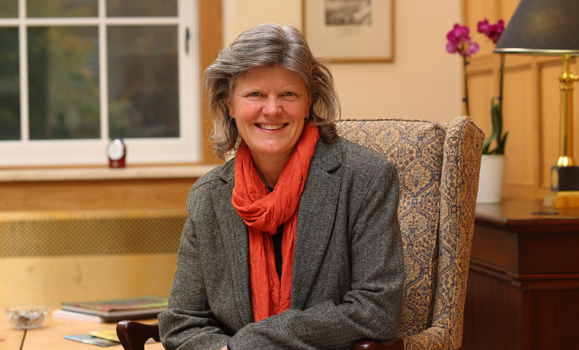 Dr. Balser joins the Dal community from Curtin University in Perth, Australia, where she served as Dean of teaching and learning and a John Curtin Distinguished Professor in the Faculty of Science and Engineering. Coming to the Atlantic Coast is a sort of homecoming for her, as she grew up in New England, also spending time in academia at the University of Wisconsin-Madison and the University of Florida. Though her academic background is as a scientist (she has a PhD in soil microbiology), she says she’s always approached her work with a people-focused spirit that made university administration a logical step. As Provost, Dr. Balser serves as Dal’s senior academic leader. She aligns university budget and plans with the academic mission of the university; ensures goals are integrated across both academic and administrative units; and provides a structure to enable clear and efficient decision making. The deans report to the provost, as do two vice-provosts (students affairs and planning & analytics) and the associate vice-president academic. People can expect to hear more from Dr. Balser as she gets to know the Dal community — and she wants to hear from you as well. She has an open survey asking for people’s thoughts, hopes ideas or concerns about the university, welcoming any and all input. “The world is changing very quickly, and the challenges to higher education are coming at us quickly as well. It is “massified and diversified:” we have more students in our classrooms, and coming from a wider range of backgrounds. The university environment is more heterogeneous than it used to be. The pace of change in terms of global engagement and internationalization is so fast and universities don’t always move as quickly as industry and the rest of the world does. All of them! I was such an academic nerd. I loved my natural sciences, ecology, and geology classes especially. I’ve always loved the outdoors and natural world. That’s part of why I’m so pleased to find myself in Halifax now. Honestly, I can’t imagine leaving academia. I’m such a geek, and I am grateful for the career I have. But let me try. Once I wanted to be veterinarian – I love animals! But now? I love architecture, and can imagine that as an alternative. Or perhaps – and probably more likely – I’d do environmental sociology. I am fascinated by people, and am committed to environmental and social sustainability. As an environmental sociologist I might be able to help in that space. Someone once told me: “You will never know what chocolate ice-cream tastes like to another person.” And it is so true. We all each have our own experience. Our reality is uniquely our own. There is humility in remembering that. It reminds me to be curious about the experience of others, and to never assume that theirs is the same as mine. I have been drawn to people who are humanitarian, and bold and visionary. Who stand up for what they believe, despite all odds. So many inspirational people. There’s the “usuals”: Gandhi, Mother Teresa, Martin Luther King Jr., Nelson Mandela, Aldo Leopold… But just as much, there are people like Mike Crow, the President of Arizona State University who has done amazing innovative things in higher education to make education affordable and accessible. And Parker Palmer, Quaker, author, and founder of the Center for Teacher Formation - whose enormous huge compassionate heart enfolds and improves us all. There are so many people I admire and would love to meet… for different reasons. People I admire from a distance. People with courage and bravery. I’d love to ask them what it took, and simply shake their hand and tell them “thank you” for their lives and their work. Barack Obama, Abraham Lincoln, MLK Jr., Gandhi, Nelson Mandela, Parker Palmer. But in the end, what I’d like more than anything would be one more day with my best friend and mentor Tom Christensen. One more dinner. He left us too soon, and there is so much that I still want to ask him, and so much that’s exciting or crazy about the world today. I want to tell him all about it, and hear his opinions and advice. He was a thought leader in the world, and he was my friend, and I miss him.